Puppy programs for dogs under 6 months old ONLY. Is your puppy causing some chaos with chewing, peeing in the house, pulling you on the leash, and never seems to hear you when it’s important? Just need a little direction? This program will start you off on the right foot with your new addition! This is the optimum time to train behaviours which will last a lifetime. This short program will give you a crash course in what you need to make the most of enjoying your new puppy. This is hands on and will give you lots of information to help get over those pesky behaviours that puppies usually have in the first few months. It will also help PREVENT a lot of pesky behaviours that tend to continue into adulthood! Since puppies, like children, are sponges and learn quickly, the earlier you can start the better. Lachie Weller from the Gold Coast Sun's had his puppy trained by us! Hazel comes to us regularly for boarding and day care. In this program we’ll get together for a long lesson first. We’ll cover all the typical “puppy” behaviours like chewing, house-training, walking nicely on a leash, sit, and food manners. By learning these and practising them, you will help prevent any future bad manners in these areas and be a joy to be around! Then we’ll get together for two more lessons afterward so we can continue practicing your new skills together. Sean Lemmens from the Gold Coast Suns and his puppy Ned came to us for training! This longer program gives you the skills to teach your new puppy house manners, help prevent common unwanted behaviours from popping up in the future, AND more time with your trainer means even more freedom to enjoy your new dog. Wish you could take your dog with you to enjoy your active lifestyle? Want to make sure your puppy grows up understanding what you say and being willing to listen? Start early and save a ton of time! This program includes more time with your trainer and more long-term support to help you customise the training program around your goals. It also gives you the peace of mind that anything that comes up in the next few months, we’ll be here to help. In this program we’ll get together for a long lessons first. We’ll cover all the typical “puppy” behaviours like chewing, house-training, walking nicely on a leash, sit, food manners, and even “place” (to go to a bed and stay). For the rest of the lessons we’ll continue working together on your new skills, adding to them and making them even more reliable based on your goals and preferences. We’ll even be able to teach more obedience commands so your puppy has a strong foundation for anything new you teach down the road. 1 extra polishing lesson to use anytime down the road if your puppy needs a little brush up. 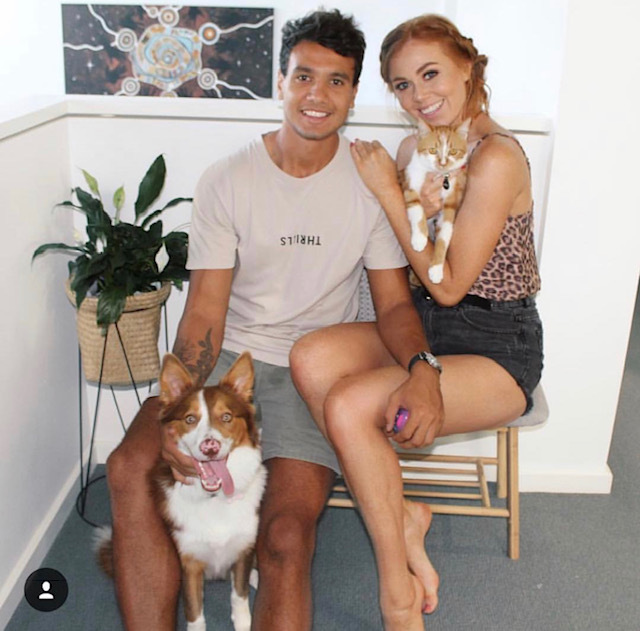 Callum Ah Chee from the Gold Coast Sun’s & Laura Hanlon with their Puppy Maple who regularly use our services.